Warren Larson, director of the Zwemer Institute for Muslim Studies at Columbia International University, served as an evangelist and church planter in southern Pakistan for nearly a quarter of a century. Stan Guthrie (M.A., missions, 1990), editor at large for Christianity Today and author of Missions in the Third Millennium, interviewed Larson about the spread of Muslim extremism in Pakistan, where the Taliban is a growing threat. It is carrying out deadly attacks throughout the country on almost a daily basis. Many observers fear for the country’s stability and its many Christians. How did the Taliban get into Pakistan? The Taliban have quite a history. United States aid to Afghanistan began in the 1980s when we were allied against the former Soviet Union. After the Soviets left in 1989, militant or extremist Muslims basically took over the country, because of the chaos. Since 2004 they have really gained influence. There is greater concern in Pakistan, because they have found a place to live there, particularly in the Northwest Frontier Province, which is on the border of Afghanistan. They are making money through opium and various other ways. They’re ruling through cruelty, violence and deceit. They claim Islam and preach Islam in the mosques and via the loudspeakers, but basically they’re ruling by the gun and by other devious and questionable means. What do you think the prospects are for keeping the extremists from taking over the country? Pakistan has been focused on the threat from India, on the eastern border. And they’ve been training for that, but they haven’t trained for the guerrilla tactics that the Taliban are so good at. Basically the police and local people have been outgunned by the militants — Taliban and Al-Qaida affiliates. I certainly hope that the paramilitary groups receive the type of training and equipping needed to deal with the Taliban in the most severe way, crush them and drive them out. The poor are victims and they’re not always sure who’s going to win. Pakistan has a significant Christian presence. From a hundred years back and the revival movements that occurred in what was then India, you had movements to Christianity, so probably about two percent of Pakistan is Christian, which is significant given the fact that there are over 170 million people there. 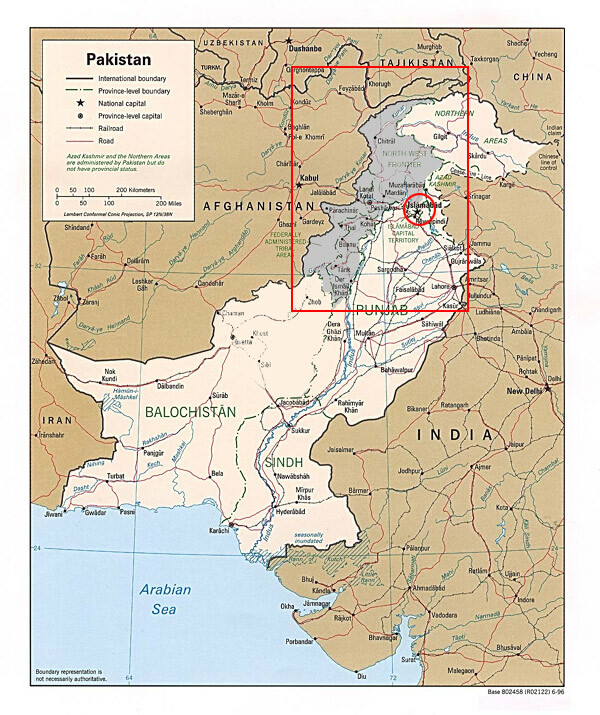 You have a significant Christian population, and there are pockets of Christians in the big cities of Karachi, Lahore, but mostly in the Punjab province. But then even up in the Northwest Frontier Province are Christians, several hundred of them, very concerned about how [the fighting] will affect them. Christians have always been under fire, discriminated against, to a certain extent. But if the Taliban have their way, the minorities, will be in very serious condition. The Taliban have been ruthless – in particular, with women. The Taliban will have very little sympathy for Christians. I did hear about a group [of Christians] up in the Swat Valley that was meeting. Since the trouble they have been afraid to get together. I’m not exactly sure what [the Taliban] would do, but am not confident they will treat minorities kindly, to put it mildly. I’m not saying that they would kill them off, but they could do anything they want. If they kill and behead women and anyone else or cut the throats of policemen, why would they have pity on the Christians? What about the Muslim converts? There are more converts than we realize and more secret believers than we realize because more and more people are fed up with Islam, and that’s a good thing. I think common people are beginning to question Islam more and more [including] the intolerable rules of apostasy. The Muslims have always said that an apostate is a traitor, and against Islam. You can enter Islam but you can’t leave it. But my hope is that there will be a greater push for a recognition of [those called] apostates. A Muslim is not only [a Muslim] culturally but a Muslim is one who theologically follows Islam, and so even if they say, “Yes, I’m a Muslim who believes in and follows Jesus Christ,” they are going to suffer. There are growing numbers of converts, if you want to call them that, in Pakistan. Where have they come from or how are they converted? They’ve been converted in various ways. The influence of Christian missions has been there for a long time, less in Afghanistan than Pakistan. Do you know how many Muslim converts there are? So do they just become members of the regular denominational churches? Some of them do, but many of them are in somewhat isolation. When we were there we did our best to gather former Muslims in various points and places in Pakistan and tried to meet with them and encourage them. But it is true that in many cases people who come to Christ through the reading of Scriptures or through Bible correspondence courses or at least in their hearts are followers, they are somewhat in isolation. Most of them don’t fit in with the church. I remember a well-known Pakistani Muslim who came to Christ, and he said that it took three years for his family and his friends to come to terms with his conversion, but it took seven years for the church to accept him. The established church, the Punjabi church, has not been very trusting or favorable toward Muslims coming to Christ, for good reason, too, because they found not all of them have been true and faithful. They don’t fit in, basically, with the established church very well. Some of them do, but the better support, the better fellowship are small cells of believers, former Muslims, who get together. But even that is dangerous, because a Muslim may come in claiming to be an inquirer, and then having all the information, betray them; and so the group will fall apart. So it is difficult at best for former Muslims to get together to fellowship, to trust one another, to pray with one another. But I think the best fellowship they have are the small groups, small cells that can meet together and find support from one another. *This figure is not based on research and there is therefore no way to substantiate whether the number should be hundreds or thousands. How innocent your first answer is Mr Larson? As if these extremists simply appeared on to Afghanistan’s political scene out of nowhere. Why so evasive about the role of US along with Saudis’ in making, training, financing and arming these extremists in order to fight their war against Soviet Union. And why not clearly say that US left that mess in Afghanistan and North West of Pakistan after the defeat of the Soviet Union. Later on the same old fanatics turned against the old allies and masters. It is not Islam that is to blame for the extremism, it is you ‘biggies’ that are to blame. It was your and Saudi money that flowed into madrassas in the north-west of Pakistan. And it was wahabi ideology which worked its way into the minds of uneducated people of Pakistan and those studying in the saudi-funded madrassas that is responsible for this current extremism. Are we talking about God and salvation, or international politics? If we’re talking about knowing God and the forgiveness of our sins, then I’m in, but this seems to be way off the topic. I have no interest in defending any country, or any national interest. I am interested in talking about eternal life and how to get to heaven? Are you? of befriending and spending time with Muslim professors at the University.